Nice to see them all playing together. Good old Kirby, always getting along with everyone for the good of the world. That's surely the reason he's teaming up with King Dedede, Meta Knight and Waddle Dee in Kirby's Return to Dreamland, coming to Wii in North America on 24th October. Nintendo just released some suitably colourful new screenshots of the pink puffball's adventure, showing off skills such as Spark, Leaf, Sword and more, as well as the gotta-have-it face-off against Whispy Woods. Is this one you'll be picking up on 25th October? look's good, i think im buying it. I won't be picking it up on October 25th as it won't be out in Australia on October 25th. Too bad I already saw these. You guys should post the character art though. I think that's more of something people haven't seen yet that's not in a video. Btw here's a high res of the cover. Also encase anyone didn't notice they polished the graphics a bit more. Look at the Ultra Sword ability, the blocks on which the enemies are standing on are more natural looking instead of squares. Wait, it says that it's being released on the 24th, yet your asking if we will pick it up on the 25th? Is that a Kuribo's Shoe rip off? This is a Kirby game I've been waiting for and I'll pre-order it so I can play it with my family members I just had a thought: If Whispy Woods is really easy in every game with only one player, how easy will it be with 4 players? @DrCruse: Whispy Woods is a must boss in Kirby game! These screenshots look terrific (except for how cute Dedede suddenly looks.). Can't wait to pick it up in December. I've never played a Kirby game, ever. Not gonna start now, that's fer sure. Looks quite beautiful, actually. Love the lil' nods to Nintendo characters/games... was skeptical, but my arm could be twisted. Looks like it plays pretty well. The ammo system for the powerups will be a nice change of pace along with the specials. Could use a graphics tuneup though. It looks weak for a wii game. So we can combine powers again like back in Kirby 64? I hope so! 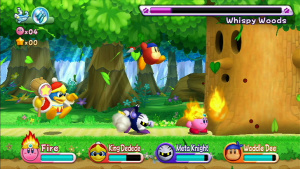 I just noticed that one shot shows four people playing as Kirby. I thought it was supposed to be like NSMBW where player one is Kirby, and everyone else chooses one of the minor minor characters. Any player can be any available character, except for player 1, who must be Kirby. Kirby doing what he's good at: side-scrolling, platforming action. These screens are gorgeous! It's also nice to see that the other players can play as different colored Kirbys instead of the three other characters. This game is going to be a blast! 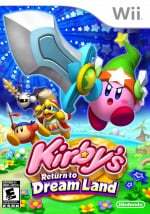 Kirby, Kirby, and Kirby confirmed for Kirby Returns to Dreamland. This makes me all kinds of happier. Awesome, you can play with more than one Kirby! I have waited 11 years for this game! And it looks like it will be Worth the wait! Just hope the next wait won't be so long. I read this and immediately thought - oh no, they changed the name again!! I'm really looking forward to this, but with R&C:A4O coming out a week earlier this may wind up under the Christmas tree like last years Kirby's Epic Yarn (and Epic Mickey, and Singstar, and Pikachu's Adventure - Santa didn't play favorites). Does anyone remember when Epic Yarn came out, if you registered the stars Nintendo would ask you to take a survey about the game for an extra 50. It had all sorts of questions about KEY and some about New Super Mario Bros regarding the 4 player.